Nearly a week after a ceasefire agreement that was believed to include the partially lifting of the blockade on Gaza, no restrictions have been eased, say humanitarians and border guards. NGOs are eager to increase aid to the Palestinian region after a 50-day Israeli bombing campaign left over 2,000 dead, thousands wounded and much of the enclave’s infrastructure in ruins, but access rules continue to present huge challenges. While the exact terms of the ceasefire agreement, reached last week between Israel and various Palestinian factions, have not been released, it was widely reported that Tel Aviv committed to easing its border sanctions in exchange for a cessation of hostilities, while Egypt, too, was expected to ease its blockade. Though many of the most contentious issues were left for further negotiations due to take place in three weeks, humanitarian workers were hopeful aid and other access policies would be eased quickly. Gaza has been under a sea and land blockade by Israel and Egypt since the militant group Hamas took power in 2007. Yet at the three main crossings – the Erez and Kerem Shalom crossings into Israel and the Rafah border post to Egypt – the previous policies have remained in place. “At both Erez and Kerem Shalom for now there hasn’t been any change in the regime of allowing passage for people and goods,” said Maria Jose Torres, deputy head of office in the Occupied Palestinian Territory branch of the UN Office for the Coordination of Humanitarian Affairs (OCHA). She said the organization had hoped for more clarity on the opening up. “We were expecting that the agreement of the ceasefire would have some kind of timeline for easing and lifting the blockade but so far we have nothing publicly. There might be something we are not aware of,” she said, referencing ongoing indirect talks between Palestinian factions and Israel. One of the key issues is reducing the number of goods for which access is limited. Among those that Israel restricts are fertilizers, cement, steel cables and even some fabrics. Tel Aviv defines such goods as “dual use” – meaning that while they are needed for the civilian population, they could also potentially be used by militant groups in attacks. 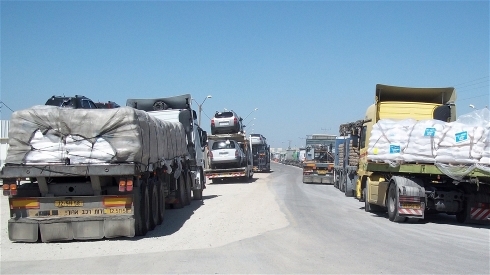 Wael Abu Omar, spokesperson for the authorities on the Gaza side of the Kerem Shalom crossing, also said officials had been expecting an immediate easing of restrictions and increase of traffic after the ceasefire. However, he said policies had not changed and the number of trade trucks entering daily had remained roughly static at its wartime level of between 200 and 250. “Honestly, we are going to have to wait and see what the days [ahead] hold for us. We are waiting for what has been promised but until now nothing has changed,” he said. Yet Paul Hirschson, a spokesman for the Israeli Foreign Ministry, told IRIN that as the exact terms of the ceasefire agreement had not been made public, much of the expectation had been based upon conjecture. At the Egyptian border, too, similar stringent restrictions remain, though hopes were raised for an easing on 28 August when the World Food Programme (WFP) was granted permission to send 18 food trucks through the Rafah crossing. The deal was the first time since 2007 that the organization had used the crossing to deliver aid, which is normally limited to entry through Israel. As fears that the blockade will not be eased grow, the people of Gaza could be forgiven for experiencing a sense of déjà vu. In November 2012, following eight days of fighting, an agreement was struck between Hamas and Israel that was supposed to ease the blockade. Many of the basic tenets of that deal were similar to what was reported of the newly-agreed one. Following the agreement, border policies were briefly eased, with Palestinians in Gaza having freer movement both to Egypt and Israel. Yet while there were initial promising signs, the deal was never fully implemented – particularly after the pro-Hamas Muslim Brotherhood-led government in Egypt was overthrown by the country’s military, a move supported by mass public demonstrations. The country’s new leader, former military general Abdel Fattah el-Sisi, is hostile to Hamas and sanctions have increased. This time, too, the threat of the deal collapsing is real, especially as there appear to be few enforcing mechanisms. Hirschson confirmed to IRIN that the terms of the agreement included no guarantees that either side would fulfil their side of the bargain. If no policy changes are forthcoming in the coming days, analysts say humanitarian access may ultimately depend on seeking some consensus during the negotiations due to take place in Cairo in the coming weeks. Finding common ground will be a monumental challenge. Among the key issues for Hamas are the release of hundreds of prisoners, and the construction of a port and an airport that would allow Palestinians freedom of movement and access to the world without Israeli control. Likewise, Israel’s key demand – the demilitarization of the Gaza Strip – is a “non starter”, according to Hugh Lovatt, the Israel and Palestine project coordinator at the European Council of Foreign Relations. “It is not realistic in any way,” he said. The fear, therefore, is that if more substantive talks stumble then the crisis will lead to nothing more than a return to the pre-war status quo – with no easing of the border controls. Lovatt said that in such circumstances donors would potentially be hesitant to back relief schemes, particularly if they felt that by failing to tackle the underlying issues another conflict would be likely. “If you are talking from the point of view as a European taxpayer, your money is going into Gaza to build things and then Israel comes and bombs it. There is an accountability issue,” he said. For the UN, the challenge is to help the parties find compromise solutions. The status of dual use goods is likely to be a key issue for lobbying. “We are fully aware of the security issues that Israel has raised and the parties facilitating the negotiations, including the UN, are looking for solutions that would be acceptable [to the Israelis],” OCHA’s Torres said. Among these would potentially be channelling dual-use items through specific organizations. WFP’s Kent said food items had been granted relatively easy access by the Israeli authorities throughout the conflict, with an average of one or two days’ wait at the crossings. “It has not been a problem to get in lifesaving humanitarian assistance to Gaza. The Israelis kept the crossing open much more than previous conflicts,” he said. Yet he pointed out that with much of Gaza’s infrastructure destroyed, food aid is only a short-term fix – stemming the humanitarian crisis over the longer term requires deals on restricted items such as cement and heavy machinery. “You can’t bring in bottled water for 500,000 people. You need to repair the water facilities. To do that you need technical equipment… that is the most cost-effective way of giving Gazans clean water,” he said. Salman Shaikh, director of the Brookings Institution think tank in Doha, said one way to help facilitate better access would be to continue moves towards a potential international mission to monitor borders. In recent weeks, diplomatic moves have been made to discuss a potential European Union force to monitor the crossings with both Israel and Egypt, thus potentially assuaging some of Israel’s security concerns while ensuring more access. Israeli Foreign Minister Avigdor Liberman has welcomed the idea. “There is a growing acceptance of the need for more international involvement on the ground,” Shaikh said, adding that it was too early to say exactly what form the force would take. This entry was posted in Israel and tagged Blockade of Gaza, Gaza, Israel, Palestine. Bookmark the permalink.